Any worthwhile endeavor requires the right tools at the right time. Developing individual and organizational leadership is no different. We are leadership and assessment experts who use validated tools backed by our professional certifications. We offer clients the assessment tools that are best-suited to their unique culture and objectives. Incorporate assessments in your leadership projects will better target needs, increase engagement, and measure progress for the investments made in your executive leaders. If you’re working to build the leadership talent for your organization to grow and prosper, we can help by leveraging leadership assessments that are contemporary, easy to understand and validated. We offer a variety of tools and assessments as an indicator of a leader’s current performance, as well as to understand their natural tendencies and skills. We have tools that help us prioritize a leader’s development and create action plans that support their growth through personal understanding. The following is a list of some of the most widely used assessments we use with our clients. Have you ever wondered why some people just don’t get you? Or ever thought “I cannot even begin to know what my boss needs—even when I ask her, I still don’t know.” Most of us have felt that way at one time or another! The good news is there’s an effective tool designed to help you understand yourself AND other people. Everything DiSC® helps you build more effective working relationships based on an understanding of different behavioral styles. Fueled by the powerful data collected by our assessments, our reports are designed to address your needs, from selection and high-potential identification to executive-level development. HoganSelect Identify candidates’ work style, understand their core drivers, and recognize patterns of behavior that could get in their way. HoganDevelop Identify strengths, shortcomings, and values, and provide managerial tips to ensure that you get the most from your employees, and that they get the most out of their careers. HoganLead Give leaders a clear understanding of their performance capabilities, challenges, and drivers, and provide them the strategic self-awareness that makes good leaders great. Hogan360° is a comprehensive multi-rater feedback tool designed to help career-minded individuals and leaders at any level of an organization gain a better understanding of how they are perceived by managers, peers, direct reports, and others. The report uses an easy-to-interpret framework to provide a real-time look at an individual’s attitude, behavior, and performance. The Purposeful Leadership Assessment is based on Linkage’s Purposeful Leadership™ Model, which is designed around the five core commitments purposeful leaders make to their stakeholders: Inspire, Engage, Innovate, Achieve and Become. These commitments represent why we have leaders, the promise of what leaders deliver, and a framework for where to direct our attention as leaders. The assessment provides insight into a leader’s overall and relative performance on each commitment, the practices that make up each commitment, and the related leadership skills. Strengths Finder 2.0 helps people uncover their natural strengths and talents. Businesses and organizations have spent far too long pointing out people’s weaknesses and shortcomings. Gallup’s assessment themes will help leaders identify and leverage their natural strengths. We suggest pairing this tool with our 360-degree assessments to offer the complete picture of natural strength and current performance. EQi 2.0 is an assessment that helps leaders focus on emotional intelligence and how they relate to others in their role as leaders. In fact, the feedback from this assessment is primary focused on leadership, not management. Information shared with the leader in this report includes self-perception, self-expression, interpersonal skills, decision-making and stress management. OPTM 360 gives your leaders easy to understand, prioritized advice for changing their behaviors. It’s superior to other 360s because it provides clear priorities for change; ensures specific, practical advice; eliminates defensive reactions; helps your leaders quickly move from feedback to action; and dramatically reduces the administrative burden for the organization. 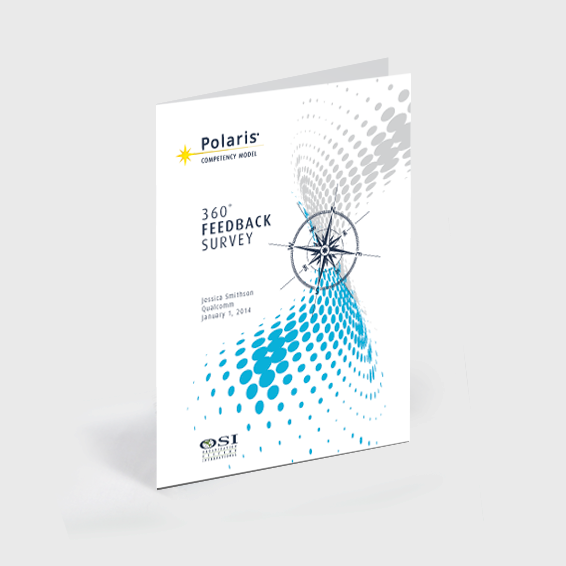 Polaris® Leadership 360 Survey is a multi-rater survey used to summarize strengths and development needs of individual leaders and their peer groups. It provides a comprehensive report, and when paired with feedback and coaching, offers leaders a clear perspective of their strengths and developmental opportunities. Clients have appreciated the depth of feedback and data needed for effective goal setting and developmental planning with this validated assessment tool.